Gorman-Rupp Super-U Series® pumps are among the most efficient self-priming, solids handling pumps available. Their unique hydraulic design and smooth wall volute casing minimize friction loss and drag. The multi-vane, open impeller is designed for high efficiency operation yet can still handle limited solids. The pumps not only deliver high efficiencies (up to 75%), they also perform efficiently across a broad operating range. Varying machine loads that cause pumps to operate right or left of its best efficiency point will affect operating efficiency by only a small percentage. 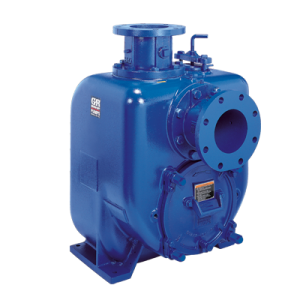 These pumps offer the same reliability and performance as the U-Series with additional features.